The Altar Server Ministry is to assist the Presider at Mass. Boys and girls must have received their First Holy Communion. Some of the duties of the Altar Server include Cross Bearer, approach Presider with Sacramentary Book, assist with preparation of Liturgy of the Eucharist, etc. For more information contact Ferdie Pabustan at 651-0128. The Gift Shop Ministry is a place to shop for gifts for all occasions like cards, rosaries, books, special sacramental gifts, etc. Our Book Store gives back to St. Catherine Church for ministry needs. Hours are 30 minutes before each Mass and 30 minutes after. For more information contact Hanne Levoit at 431-4237. The Candle Ministry provides votive candles for personal prayer needs. The Candle Ministry uses volunteers to pick up candle freight at the dock and transport to the Church. The Candle Ministry also needs assistance to clean the used candles before the weekend Mass on Saturday. For more information call Yvonne Pascua at 639-4825. Catholics Returning Home Ministry begins by becoming conscious of past injustice to former Catholics whether perceived or misunderstood and others who have left because of personal challenges. This Ministry is designed to welcome and encourage dialogue through prayer, study, and action. Catholics Returning Home works toward helping inactive Catholics resume active practice of their faith. For more information contact Stan Fiorito at 828-1878. The Church Decorating Ministry decorates the church each week with fresh flowers and decorations liturgically suitable for each Mass celebration. Special effort is taken to embrace our Hawaiian culture and the many flowers that speak of who we are. This ministry demonstrates the gifts, talents, and colorful array of flowers to bring praise and glory to God. For more information contact Brenda Viado at 346-1436. The Engaged Encounter Ministry addresses the couple with tools to prepare them for the Sacramental commitment of Marriage. Couples attend a 6-month preparation that encourages couple dialogue and understanding of a spiritual relationship founded on biblical standards. Each couple ends with an Engaged Encounter weekend that brings the couple to join with other couples journeying toward Matrimony. For further information contact Mike Cruz at 822-7900, ext. 250. The St. Catherine Music Ministry is comprised of both volunteers and professional musicians dedicated to this ministry. This ministry reflects our unity in leading our assembly to giving glory and praise to God through music. Join together in song under the direction of Mrs. Renee Thronas at 822-4657. The Parish Pastoral Council is a consultative body consisting of parishioners who represent the diversity of the parish community. It is the mission of the Pastoral Council to work with the Pastor in developing pastoral goals and promoting spiritual growth and renewal in the parish. For more information contact Al Nebre at 828-1417. Ushers and Greeters at St. Catherine Parish warmly welcome parishioners and visitors to each Mass. Visitors are especially welcomed with a shell lei and our Aloha spirit. Ushers care for the duties of the offertory gifts, handle the collection, and assist with special needs persons. For more information contact Chris Brun at 639-7187. The St. Catherine Finance Council advises the Pastor on financial matters of the parish and school. The Finance Council is responsible for monitoring all income and expenses and approving the annual budget. The Offertory Counters Ministry counts the collections from the weekend Masses. This is done each week and reported through a series of safe financial reporting procedures originated from the Diocese. For more information contact Carmen Nakasone at 822-7900. Families in Crisis Ministry begins by being compassionate to the personal needs and challenges that have led to a “crisis” condition.This ministry collaborates with County, State, and Federal agencies to find professional assistance for specific problems such as addictions, domestic violence, sexual assault, divorce, child/teen support, unplanned pregnancy, bullying, prison, suicide prevention, single parenting, etc. For further information contact Chick Todd at 822-1175. The Fundraising Committee assists the Parish in raising additional funds for specific projects that follow the building and maintenance needs that become urgent. The Fundraising Committee looks for volunteers who are willing to create ideas and produce results for maximum impact. Some of the projects include Breakfast, Spaghetti Dinner, Bingo, and beef raffle. More ideas are welcome. For information contact Shelby Dabin at 651-2354. The Funeral/Bereavement Ministry is a support and healing ministry for families who have suffered a death of a family or friend. The Funeral/Bereavement Ministry provides assistance for the funeral liturgy as well as choir music for parish funerals. For further information contact Yvonne Pascua at 639-4825. 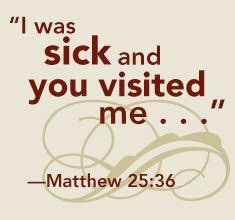 The Homebound Ministry is Eucharistic lay ministers who visit those who are ill or convalescing at home or in a hospital. They provide weekly visits and bring the Holy Eucharist within the context of a brief liturgy. For further information contact Deacon Manny Pascua at 822-3980. This ministry is made up of a committee of lay people to assist the Pastor in providing liturgically accurate celebrations in keeping with the Church’s Liturgical Calendar. This ministry includes gifts of music, liturgy, art and environment, etc. For more information contact Stephen Villanueva at 822-9481. The Stewardship & Development Committee is designed to address the gifts from God that is given to each of us and how to use these gifts of Time, Talent, and Treasure to further the ministerial work of the parish. This recently formed Committee educates and encourages the spiritual concept of expressing with grateful hearts the abundant providence and blessings we are called to share. For further information contact Bronwyn Farias at 635-2339. Rite of Christian Initiation of Adults is a ministry in the initiation process of preparing adult candidates for the Catholic Sacraments of Baptism, Reconciliation, Holy Communion, and Confirmation. The process begins in September and ends at Easter. If you would like more information contact Chick & Crucita Todd at 822-1175.